Local Trust - Are you managing land or a local asset? Or have you thought about the opportunity? We've just announced that Shared Assets will be working with Local Trust over the coming months to explore opportunities for Big Local areas in land and asset management. We know there is ambition in some Big Local areas for land management to form part of the legacy and on-going sustainability of projects. We are exploring where the opportunities are, what challenges exist and what support might help take some of your ideas to the next level. To do this we will initially be carrying out research with Big Local areas in the form of an online survey and telephone interviews. This valuable information will feed in to a learning and networking event at the end of November where we will show our findings, look to support network building among peers and inspire Big Local areas to think more about the role of land projects in creating a legacy for their Big Local grants. If land management is something you’re interested in, whether for food and growing, biodiversity, conservation, health and wellbeing, parks, woodlands and anything in between, we’d love you to join us at our event for Big Local areas in November near Kings Cross, London. The day will be great opportunity for networking and learning for those already involved in land management and those who have ambitions or ideas to explore. What would you like to do with land? We need your views! Whether or not you can make it to the event, you can contribute to our ongoing research by completing the Big Local land management survey. By sharing your knowledge and experiences, you’ll be contributing to the knowledge base of what can be done with land and what challenges there are. This will help to shape a new support package we'll be developing for Big Local areas, and ensure our event covers the issues that are most important to you. Later in the year Local Trust will be launching an open call for Big Local groups who would like to access a new support package from Shared Assets, which will be paid for in part by the Big Local area and match funded by Local Trust. If you are interested or want to be involved, get in touch or keep an eye on the Local Trust website in December. We also strongly encourage you to attend the November event as it is a good way to get to know myself and the Shared Assets team, and find out more. 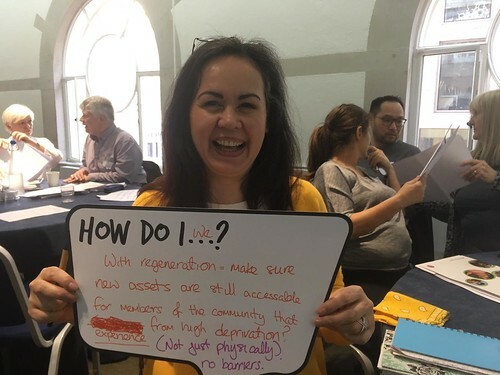 Local Trust’s partnership with Shared Assets is one of a range of new opportunities offering Big Local areas access to a wider range of expert support for resident-led local transformation. Together, they give Big Local areas connections to new resources and networks, specialist technical advice tailored to local needs and access to fresh and innovative approaches.